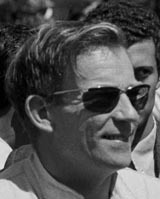 Peter Arundell raced in 13 grand prix for Lotus between 1964 and 1966 after winning the British Formula Junior Championship in 1962 and 1963. As second driver to the legendary Jim Clark, he was considered a real talent, but in the end injury curtailed his career. He made his F1 debut in 1964 and finished third in his first two races, but four rounds into the season he was seriously injured, sustaining multiple injuries including two broken legs, when thrown from his car in an F2 event at Reims. He was out of action for the rest of that season and all of 1965, returning to F1 action in 1966. However, he struggled to regain his earlier form and quit at the end of the year. He subsequently moved to Florida where he founded a software company.